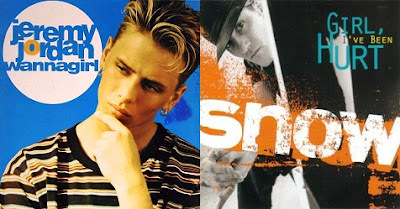 This week in 1993 on the ARIA singles chart, two instances of a common problem for musicians occured: the less successful follow-up to a smash hit debut single. In both cases, the earlier hits were still inside the top 10, while both new singles would end up stalling at the top 30 and go on to be all but forgotten about by the general public. A song that wasn't going to be forgotten about was still at number 1 this week in 1993. UB40 spent a third week on top with "(I Can't Help) Falling In Love With You". 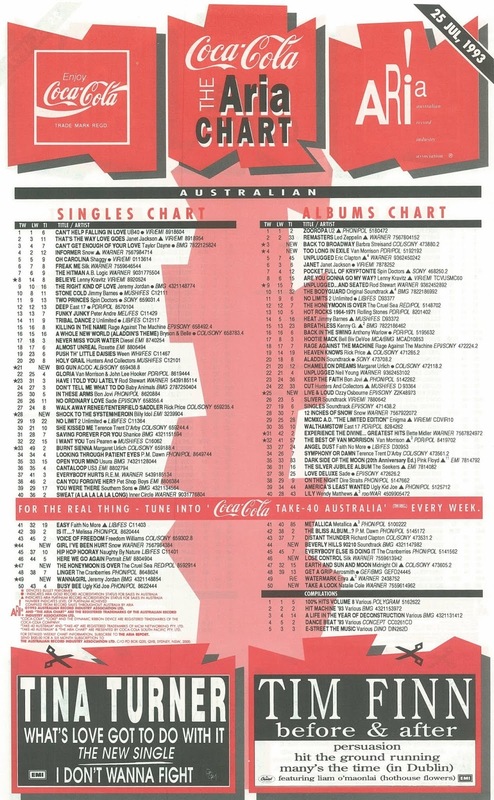 Kicking off the Symphony Or Damn campaign in Australia with "She Kissed Me" had been a good move, with this UK lead single peaking 60 places lower on the ARIA chart. Seven years after he scored with "Party All The Time", not even the presence of Michael Jackson (in whose "Remember The Time" clip he'd appeared) on guest vocals could help Eddie Murphy land another hit with this new jack swing-lite track. As "Two Princes" dropped out of the top 10, the US band arrived with this follow-up, which features album title Pocket Full Of Kryptonite in its lyrics and is about the Superman photographer trying to lure Lois Lane away from the Man Of Steel. And here's Jacko again with the eighth single from Dangerous - and the first to miss the top 50, although this "Man In The Mirror"-esque ballad would reach number 42 in the wake of Mchael's death in 2009. While "The Right Kind Of Love" moved back up inside the top 10 in its 16th week on the top 50, teen heartthrob Jeremy Jordan unleashed his follow-up, a fairly forgettable slice of watered down new jack swing that had originally been a B-side for "I'll Be There" guest vocalist Trey Lorenz. In fact, so forgettable is "Wannagirl" that, despite almost reaching the top 20, the song has been pretty much written out of pop history, with the buff blond widely considered a one-hit wonder. (Of course, he's not.) In the music video for "Wannagirl", Jeremy once again flaunted that chiselled physique, swapping the basketball court for the boxing ring as an excuse to get his shirt off - not that his fans were complaining. I'm a bit shocked to recall this title track from The Cruel Sea's breakthrough album and the follow-up to breakthrough single "Black Stick" didn't actually reach the top 40. "The Honeymoon Is Over" seemed to be everywhere at the time and felt like a much bigger hit. Of course, the fact that the album was only in its seventh week on the chart and had recently been in the top 5 might have had something to do with this single's lack of chart success. Nevertheless, the song's classic status was cemented when it won the ARIA Awards for Song and Single Of The Year the following March. Here's our second male artist following up a still-massive hit - "Informer" slid down to number 4 this week - with a song that many people have entirely forgotten reached the top 30. And fair enough, since it's likely that without the prior success of Snow's chart-topping track, "Girl I've Been Hurt" would not have done anywhere near as well. A fairly monotonous reggae-inflected ballad, it would be the last we'd see of the Canadian performer on the top 50. If you watch the video below to refresh your memory of "Girl I've Been Hurt", spare a thought for the poor female dancers forced to cavort around in bikinis and unfastened winter coats in freezing conditions. He'd been registering hits on the ARIA chart for more than a decade, including six top 10 singles, but despite crashing into the top 30 this week in 1993, Billy Idol got no further with this double A-side release from Cyberpunk. Something of a concept album inspired by Billy's interest in computers, the nascent internet and electronics, Cyberpunk was a natural progression from the synthrock we'd come to expect from him, but neither original track "Shock To The System" (which came with an LA riots-inspired music video) or cover version "Heroin" (originally performed by The Velvet Underground) were up to his usual standard. In July 1991, Guns n' Roses' "You Could Be Mine" had provided the soundtrack for Terminator 2: Judgment Day. For Arnold Schwarzenegger's latest blockbuster, Last Action Hero, it was AC/DC's turn to bring the rock to the big screen. And that's pretty much all I have to say about this song, which even the band themselves seem to have more or less forgotten about. I'm going to have to defend Wannagirl and Girl I've Been Hurt. I much prefer those songs to their more successful predecessors. Probably because those second singles haven't been played to death like the first ones. Hmmm, this must have been the week I set my alarm for some ungodly hour (probably 4 am on Sunday) just so I could get up in time to tape the "Girl I've Been Hurt" video off Rage. I must have needed my head examined! 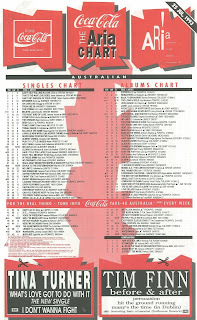 Another week in '93 with only male-artist new entries. The Terence Trent D'Arby track should have done better. I hadn't noticed this before (or had forgotten), but the song seems to sample vocals from Deep Forest's 'Deep Forest' in the middle-8 section. 'Watzupwitu' is no 'Party All the Time', to put it mildly. Never much of a fan of Spin Doctors, I didn't mind 'Jimmy Olsen's Blues' (for them). I am surprised it flopped, though, because they were BIG around this time/a couple of months before. Maybe people got sick of them quickly, or were just buying the album instead. The singer looks like he could be a hipster now. I always hated 'Will You Be There'. Michael's voice sounds like Big Bird's again on it. I'm with Andy when it comes to 'Wannagirl' - I actually prefer it to 'The Right Kind of Love'. But you're right; it has been totally forgotten. I'm not a huge fan of 'The Honeymoon Is Over', despite liking 'Black Stick'. It is surprising it stalled at #41 though, given how ubiquitous it seemed to be at the time. While I wouldn't say that 'Girl I've Been Hurt' was "better" than 'Informer', I like the more relaxed vibe it has. And yes, it wouldn't have don't nearly as well/probably wouldn't have charted if 'Informer' hadn't been a huge hit. I never cared much for 'Shock To the System', and hadn't heard 'Heroin' before. Joining Big Bird (Michael Jackson) on the chart this week is Gonzo (AC/DC), going by the vocal on 'Big Gun'.